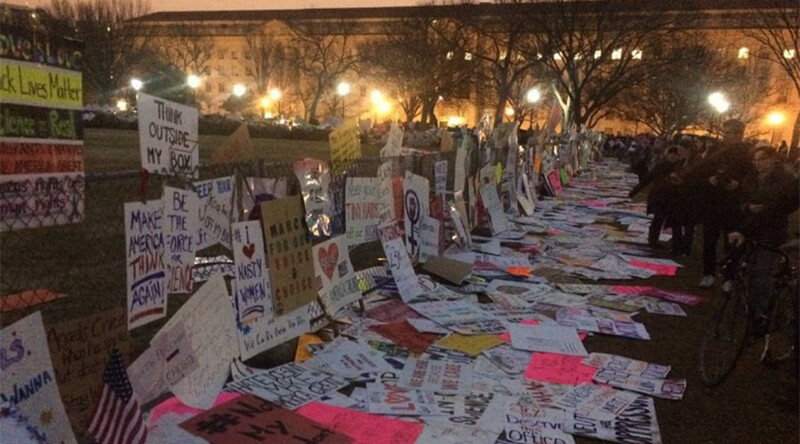 They may have attracted the headlines, but the anti-Trump protesters who attended the massive Women’s March in Washington DC, are now drawing criticism for abandoning their placards at landmarks and on the capital’s streets. Organizers say that more that 2.5 million people took part in demonstrations around the world on Saturday, as protesters voiced opposition to President Donald Trump while also calling for the protection of civil liberties. The largest of the events was held in Washington, DC where over half a million people took to the streets, according to AP. Many, if not most, of the protesters came equipped with placards criticising Trump and highlighting their various causes. Following the march, tens of thousands thousands chose to leave their signs outside various DC landmarks including the White House and the Trump International Hotel. This action received significant support on social media, with some people supporting it as a graphic, lingering illustration of the sentiments behind the mass gathering. #WomensMarch protestors are also leaving their signs in front of the White House. Many others however, were critical of the move, describing it as selfish littering. “I guess the environment or personal responsibility isn't something they're concerned about,” Conservative blogger The GOP report wrote on Twitter. I don't appreciate protestors leaving their signs behind. What about the environment? Video of a man wearing a pro-Trump Make America Great Again hat cleaning up rubbish received more than 4,000 retweets and 5,000 likes on the social network.